My first contact with Mr Sparks was in 1940, when I was fifteen years old. My father's sister Elisabeth, who spent most of her life in China, seemed to have made contact with him and subsequently introduced Watchman Nee to him. I am not sure of the detail of these associations, but about the Spring of 1940 my father met Watchman Nee, and Mr Sparks. 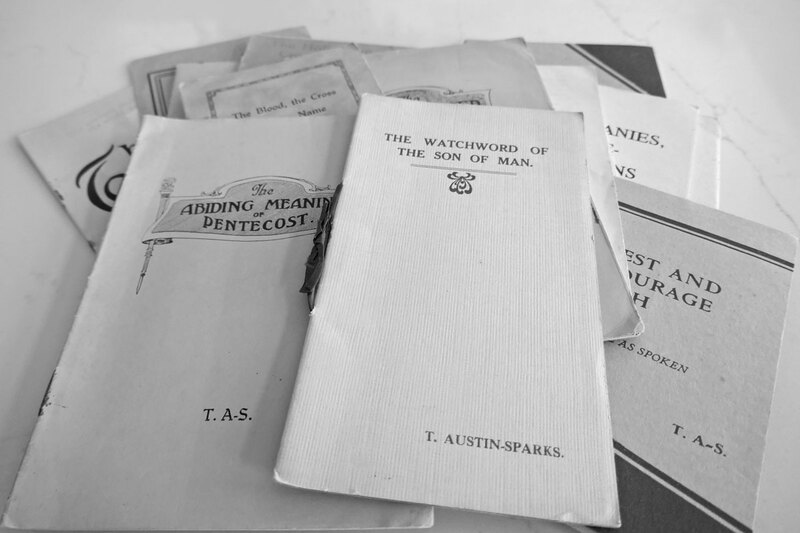 Around that time Mr Sparks held some open meetings in a hall in Glasgow, and subsequently a meeting was started in our home which had a close association with Mr Sparks and Honor Oak. Mr Sparks visited our home from time to time thereafter, and as a family we visited Heathfield House, on the Clyde Coast at Kilcreggan. Heathfield was owned by the Honor Oak Fellowship, and Mr Sparks and his family spent quite a part of each summer there, where Christian Conferences were organised at intervals. I myself was baptised in the small chapel there at the age of 18, by Mr Sparks, and as a student started to visit Honor Oak in London during Conferences. We got to know most of the leading elders from Honor Oak during these years, as they came North to speak at meetings, and by the time I graduated in 1948 I knew Mr Sparks a little on a personal basis. When in Africa in the Army, I was asked by Mr Sparks to visit the Ethiopian town of Gondar, to look at a small rural hospital. The suggestion was that I might take on clinical responsibility there, as a form of Christian service, but I did not feel called in that direction. On returning home to UK in 1951 I spent a few days at Kilcreggan, when Mr Sparks asked me if I would be interested in joining a group of about 15 young men who were to spend three months studying the Bible at Honor Oak. I met some of the others who were planning to go, including David Harris and Richard Akeroyd, and I readily agreed to take part, since I was at a crossroad as regards resuming medical work. David Harris and I were appointed the leaders of the group, and Mr Sparks would often call us into his study, and talk with us about his interest in the group of young men, and his concern for their spiritual growth and welfare. At the end of the three month period, Mr Sparks spoke separately to David, Richard and myself about going with him to the U.S.A on one of his regular conference tours, and in due course, early in 1952 we travelled over to New York on the Queen Mary, to be joined by him in a week's time - he had been held up by illness. He stayed with us for about three weeks, as I recall, and the rest of the time we moved about by invitation, covering 6000 miles by car, over a period of six weeks. Often we would sit with him in motel dining rooms and he would talk about the Lord and about the Word. On journeys in the car he would sometimes open up and tell us about his past experience, about the spiritual issues that concerned him. We would pray together about the trip we were taking, and about the options open to him for establishing some kind of Christian base in the USA. Around that time I contemplated the possibility of 'full-time service', as it was called, but finally decided that God was not leading me that way, and I returned later in 1952 to work in the Western Infirmary in Glasgow. I continued during that time to work with the small Assembly which had by now moved into premises near Charing Cross, and Mr Sparks would visit there from time to time. I continued my friendship with him through contacts there, at Honor Oak, and at Kilcreggan. In 1955 he conducted our marriage in Glasgow, and in 1956 he wrote to ask if I would consider responding to an invitation for a Christian doctor to go and work in Hong Kong with the Watchman Nee church connection there. My wife Mary and myself, with our 5 month old son Colin sailed for Hong Kong in Spring of 1957, and from time to time over the next ten years corresponded occasionally with Mr Sparks. On leave twice I visited him, and on each occasion spent several hours with him, talking to him about the church in Hong Kong, and listening to his views. Returning to UK in 1967 we settled in Scotland, and my contact with Mr Sparks was quite limited - a family of four young children kept me busy north of the border. Two things make me sad as I sit down to write about him. First, that I did not keep notes of my conversations with him. My diaries contain much that I believe came to me from or through him, but I have not kept any kind of record of my association with him over all these years. Second, I am appalled to find that my memory is so threadbare - not in terms of pictures, but in the substance of what he said to others and to me. I have a good visual memory, and have hundreds of vignettes that can be readily recalled - pictures of himself, of visits to his home, sitting with him in cars, listening to him preach. I can see his face grim and forbidding, wreathed in broad smiles, quizzical and leg-pulling. I can see him sitting at the head of the long table at Heathfield, so often a little withdrawn, observing everyone, and saying little. I can see him in old clothes fixing a fence in the garden, wheeling a wheelbarrow. I have pictures of him talking with God, with such certainty and conviction. He was hopeless at small talk, and clearly found the intervals for tea at conferences an agony. He was so ready to sit down and talk seriously, or listen carefully, but the superficial chat that usually characterises such occasions he simply could not cope with. Most people were nervous about approaching him, since they found it difficult to get him into conversation. He would usually be seen standing on his own, or sitting on his own. I think he would like to have been chatty and involved in conversation, but he could not do it. He was always grateful when people approached him to talk, or even just to sit there with him. After I discovered this about him, and since I have the same isolation problem, I used to go over and sit beside him, and say nothing. He was quite happy with that. Despite my very vivid and quite vast visual memory, I cannot remember what was said in our conversations! There are very few things that I can recall, either from his preaching or from personal talks! The former are widely recorded and read, the latter are locked within me for ever, I think. Perhaps some of it will re-emerge from time to time, and I can add it. A thoughtful and thorough approach to the things of God characterised him in everything. He was plagued with ill-health. He had a series of gastric operations in attempts to heal peptic ulcers, and was often quite physically low. Despite that, he gave himself totally to the work of preparing the messages that were to be preached at various conferences. Nothing would stop him from reaching the platform on the day, and declaring the message that he believed God had given him for people. I am sure that the powerful impact of his preaching was due to the thorough prayer-based preparation that went before. I have observed baptismal services in a number of church settings, but the services conducted by Mr Sparks were exceptional. First, he took the matter very seriously. He considered it to be a major milestone in the life of the believer, and he made a real effort to ensure that it would be memorable. He would first talk with the candidate, ascertaining the reason for the decision to be baptised, and making clear the meaning and implications of the event - and it would be an event. The service itself was dedicated to the matter of baptism - there was no question of tacking it on at the end of another meeting. Good hymns were sung, and serious prayer made. A message was given to the candidates, and others attending. Then the baptism itself was strong and clear in its enunciation, and each candidate was personally given a verse of Scripture which Mr Sparks had carefully and prayerfully selected. (Mine was important to me for the rest of my days - "Be steadfast, unmoveable, always abounding in the work of the Lord.") After the baptisms, and after drying and dressing, each believer was prayed over. Mr Sparks and one of his eiders would stand beside each, placing their hands on his or her head, and praying specifically, and I suspect prophetically for them. Despite his rather forbidding exterior, he was an extremely kindly man. He was always concerned for people who were in difficulties, and would not forget to enquire for health and welfare. a. An "open heaven." At some point after setting up at Honor Oak - or was it before leaving the Baptist Church - he had an experience, a change in his life as a servant of God which remained with him for the rest of his life. He called it "the open heaven." He did not imply that it was a unique experience - in fact he wished it upon us all. The simplest way of explaining it was his own way - prior to this, probably in common with many other ministers, every week was a treadmill of preparation for preaching. Three or four sermons had to be produced, and most of the time it was tough going, and at times exhausting physically and mentally. Then something happened - I do not recall how it came, but the Scriptures suddenly opened to him, and he found that so much flowed from them during his study times that he could not contain it - could not use it all. That experience seems to have followed him for the rest of his days, and to that he attributes whatever blessing came from his public ministry. b. Broad themes. He believed that God had revealed certain broad concepts to him - not exclusively of course, but referring to his own spiritual development. He told me personally that at the time he left the Honor Oak Baptist Church his main concern was for the teaching of the Cross in the life of the believer. He taught little else for some years. Subsequently God directed his attention to the importance of the Church, eternal and local, and he gave himself to teaching and preaching the Scriptural and spiritual principles involved almost exclusively. At the time of our conversation - 1952 - he was totally convinced that the overriding message in his heart and mind, was to do with the centrality and incomparable importance of the Lord Jesus Christ Himself - without of course diminishing the earlier two stages of his spiritual pilgrimage. I clearly recall the occasion when he shared these thoughts with me. He had invited me the previous day to be one of the trio going with him to the States, and I found myself with considerable unease about the idea. I felt that while I fully endorsed all that he had taught me over the years, these ideas and convictions were not really my own, and I could not stand up and preach to others things that were not mine, but his. I asked for a private interview with him, and told him of my decision not to go. I explained to him that all I could do would be to share with people my own personal experience of Christ, and my own limited knowledge of the Word. "Eric," he said, "that is absolutely all I ask of you, and I definitely want you to come." So I went. It would be difficult to enumerate the spiritual lessons I learned from and through this man, but one or two stand out from the others. a. A sense of quest - of all the things I received from Mr Sparks this has been the most significant during my years. One of his favourite hymns contained the line "the Lord has still more light and truth to break forth from His Word." He taught us to follow after God, to pursue the things of the Spirit relentlessly. We were taught never to be satisfied with what we had gained so far, but to reach out after more. He positively reinforced any sense of spiritual hunger, and it became for me the basis of my Christian experience for the rest of my life. I still feel within me that drive to know God better, to understand Him more clearly and deeply through His Word, and to experience whatever He has for me during this life. Mr Sparks lit that fire. He was, of course, totally committed to the authority of the Word of God, and never to my knowledge stepped out of, or beyond, the clear meaning of Scripture. It is possible within the confines of conservative evangelical belief to have particular thoughts about non-central issues, and all preachers have their own idiosyncratic views about some passages of Scripture. I know of no occasion when l felt that his teaching was other than orthodox and firmly Scripture based. b. Bible Study. When I was still a medical student, aged around 20 years, he took me aside one day and told me that if I ever wanted to be used by God in Christian service, I would have to get to know the content of the Bible. He suggested that I look for a copy of The Bible Handbook, by Joseph Angus, M.A. D.D. and I was thrilled to find this long out of print book on a second-hand barrow stall in the centre of Glasgow. I believe he based this conviction on the record of Timothy's family history - he was taught the Scriptures, which in due course made him "wise unto salvation." If we are not familiar with the content of Scripture, the Holy Spirit cannot be expected to lead us about in it, and throw His light on what we do not know. He directed me to study and become thoroughly familiar with each of the books of the Bible, not initially concentrating on spiritual significance, but getting to know what was written there, and learning to find my way around the text of Scripture. That advice has proved immensely valuable to me. c. Preaching. I recollect his speaking about the preparation for preaching. He gave the illustration of the iceberg, 70% of which is below the surface. He taught that what we said from the platform should only be 30% of what we had discovered in our study in secret. There must be a thorough Scriptural basis for everything declared, so that if questioned, we should be able to confirm the truth of what was being taught by multiple Bible references. d. Rebirth. On one occasion during our period of Bible Study in London, in general conversation I mentioned a period in my late teens when I had drifted away from a whole-hearted commitment to God and to the Christian way. I had not been involved in anything bad or unhealthy, but simply cooled in my Bible reading and prayer, and daily walk with God. Later, having overheard this conversation, he took me aside and asked me if at that time I had doubted the reality of my Christian experience, in particular with regard to my rebirth by the Spirit. I was able to reassure him on that point, but I was interested to note the considerable concern that he showed about this vital issue. During the years of my own Christian life and service, I have reached different conclusions from him as to the issues of greatest importance in my day and in the settings where I have served God. However, his spiritual influence on my beginnings have entirely underpinned the subsequent progress of my Christian life and spiritual experience. The effect of his basic teaching has been only positive and good for me. I did not live closely enough to him for any period - being domiciled in Scotland and overseas - to notice personal weaknesses. If I must make one comment which is on the negative side, it is this. He taught his young people to think for themselves; to seek in the Word and find; to follow after God earnestly and closely; to pursue the highest standards of Christian life and behaviour. I notice that many of those who learned from him have a tendency to individualism. We do not fit in easily to a group and that is bad. He encouraged the pioneer spirit, and while 'corporate' was one of his favourite words, the quest made it difficult to settle in the status quo. I have this problem myself, although I do not personally blame him for it. It is an unavoidable consequence of the urge to go further. While I have had no difficulty in fellowship with my brothers and sisters in the churches where I have worshipped over the years, I think they would probably regard me as somewhat of a maverick, simply because I am never entirely content with things as they are, and want to suggest changes that will lead us on! While I still think that attitude, which came from T.A-S. originally, to be a good thing, it can also be a bad thing.